Theatre Is Easy: "The Royal Family"
BOTTOM LINE: A well-done revival of a very funny play. Some theatrical experiences are just perfect: all of the elements (cast, design, technical aspects) come together is a totally satisfying way and it’s apparent the story is best told on a stage. These are the shows from which you walk away with total respect for those involved with the production. Whether or not you liked the play itself is a separate matter, as you appreciate the experience regardless. I consider The Royal Family, playing at Manhattan Theatre Club’s Friedman Theatre, to be in this particular category. It’s just a really solid production. The story takes place in 1927 and was written around the same time, by the super-gifted team of George S. Kaufman and Edna Ferber. It’s a farce about a show-biz family (the “royal” description being tongue-in-cheek). The Cavendish clan includes three generations of stage actresses: Fanny is the matriarch (Rosemary Harris), Julie is her daughter (Jan Maxwell) and Gwen is Julie’s daughter (Kelli Barrett). The three women have found themselves at crossroads, independent of one another, and all must decide what to do with their lives. Fanny is aging and isn’t able to handle the busy life of an actress like she used to, Julie is happy being a diva until a wealthy suitor reappears in her life and offers her a domestic alternative, and Gwen must decide if she should quit the stage and marry her boyfriend, who isn’t too excited about playing second fiddle to his wife’s burgeoning career. When something is your passion, for whom is it worth giving up? Can you have both love and a successful career or does something always have to give? And what happens when you can no longer do what you love? Although presented in an overly dramatic, vivacious way, the questions asked in The Royal Family offer a thoughtful look at these circumstances. The play is a comedy, though, and the humor overshadows anything remotely serious. Doug Hughes’ direction is gloriously indulgent and the cast dances around the stage, in step with the chaos that is the Cavendish household. Jo the butler and Della the maid (David Greenspan and Caroline Stefanie Clay respectively) serve as the overworked and under-appreciated stable ones in the story who really hold everything and everyone together. Herbert and Kitty Dean (John Glover and Ana Gastayer) are Fanny’s brother and sister-in-law who love to mooch off the Clavendish fortune. Tony (Reg Rogers) is Fanny’s eccentric son who ditched the stage for the screen and is currently on the run from the feds. Oscar Wolfe (Tony Roberts) is the family’s manager, who just wants the best for the talented clan. Perry Stewart (Freddy Arsenault) and Gilbert Marshall (Larry Pine) are the suitors with whom Gwen and Julie could chose to live quiet, domestic lives. Perry and Gilbert are the straight men in a sea of crazy. Crazy is perhaps an overstatement, as the family is so damn endearing it’s hard to judge them too harshly. That is in large part due to the cast, who offer larger than life portrayals of their characters while still managing to make them sympathetically real. The script is also successful at walking the line between overdramatic storytelling and legitimately believable familial relationships. One of the reasons the play works so well is that it is a microcosm of itself without being in your face about it. The play is about a theatrical family, so the play itself can be theatrical, fitting perfectly with the vibe of the show. A big Broadway production with a set of a grand house decorated with burgundy velvet is not only appropriate for an over the top portrayal of a dramatic family, but it’s also believable that it’s what the Cavendish house would look like. Giving Jan Maxwell room to throw an enormous tantrum that leaves her face down, center stage, is not only hysterical to watch but it also seems plausible that her character would behave in such a manner. The audience laughs at the outrageous behavior on stage and yet remains in tune with the story, as the characters themselves are mildly outrageous. 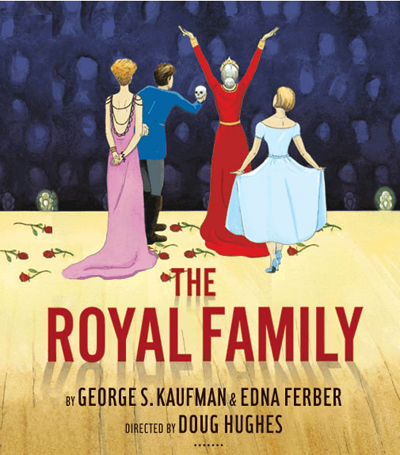 The Royal Family is an entertaining production of a hilarious play. The comedy itself seems more modern than I had expected, even a little on the sarcastic side at times; this could be a function of Hughes’ direction, or proof that Kaufman and Ferber were ahead of their time, or maybe a little of both. I’m not sure how it played comedy-wise when it first opened on Broadway in 1927, but it played for over a year and then saw two revivals, in the 1950s and again in the 1970s, although those runs were a bit shorter. Sometimes you just want to see good theatre, something that will make you laugh and feel something for the characters in the story. This production is a safe bet if you want an entertaining night out. It’s not highbrow and it’s now pedestrian, rather it’s appealing on a mass level that I think most people would sincerely appreciate. The performances are really outstanding and the production values are high. And with its generation-spanning characters, it’s probably a safe bet for the whole family. The Royal Family plays at Manhattan Theatre Club’s Samuel J. Friedman Theatre, 261 W. 47th St., between Broadway and 8th Ave. Performances are Tue 7 PM,â€¨Wed-Sat 8 PM,â€¨and Sat-Sun 2 PM. Tickets are $57-$97 (student rush tickets are $25) and can be purchased at telecharge.com or by calling 212-239-6200. For more show info visit mtc-nyc.org.